What’s the story, morning glory? My story includes two things: Me, and these amazing Morning Glory Pancakes. 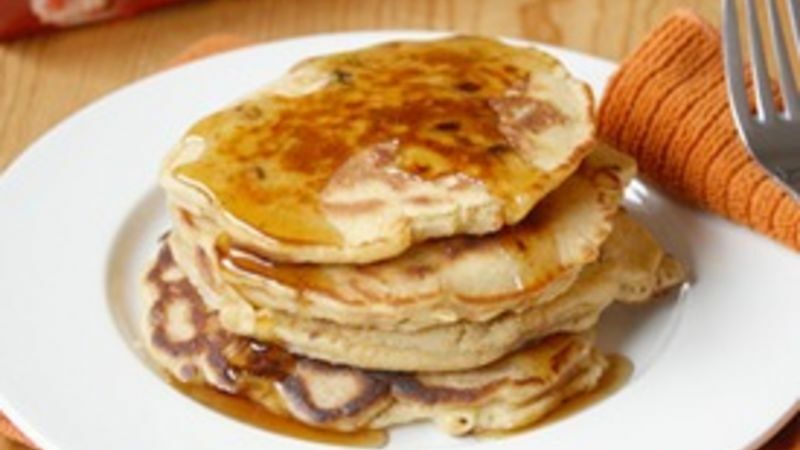 They’re a twist on classic, delicious Bisquick pancakes mixed with quintessential, wholesome ingredients you’d find in your favorite morning glory breakfast muffin. Part of me was hesitant to tamper with the amazing original pancake recipe – after all, it’s been in every Betty Crocker cookbook since 1950! Who could top that? But what’s great about these Morning Glory Pancakes is even though they contain a handful of extra ingredients, the signature pancake flavor still shines through. It’s a veritable pancake miracle. I don’t know what it is about the combination of raisins, coconut, carrots, apples and nuts that makes for a yummy breakfast treat, but whatever it is, it works. 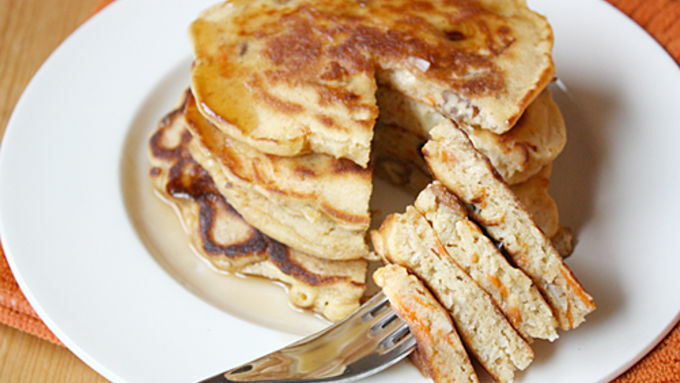 The pancake texture is equal parts crunchy and fluffy, with a dynamic flavor palate of sweet and savory all at once. You can top your pancakes with a dollop of maple syrup, powdered sugar or fresh fruit, or eat them plain – the flavors hold up on their own. I suggest pairing a few of these with some bacon for a serious sweet-and-savory breakfast. Two things to keep in mind when making your pancakes: One, don’t overmix the batter. Even though there may be a few lumps left, it’s worth it to render the tenderest pancakes. And two, be sure to wait for bubbles to form on the top of the batter when you’ve got the pancakes on the griddle – that’s a sure sign it’s cooking all the way through. 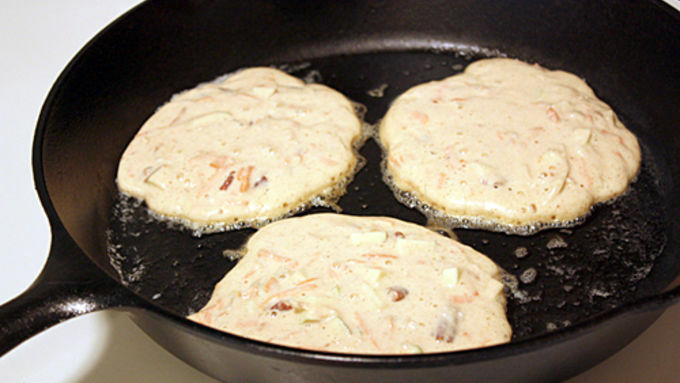 With extra mix-ins, it can take a little bit longer to cook the pancakes in the middle. The next time you’ve got a hankering for a glorious breakfast, make these Morning Glory Pancakes. They’re worth getting out of bed for!